People of all ages experience forefoot problems. There are numerous disorders that can affect the joints in the toes, cause pain, and prevent the foot from functioning as it should. Overlapping and underlapping toes are examples that may occur in any of the toes and cause pain and difficulty when left unaddressed. Any problems that cause pain or discomfort in the toes—or anywhere in your lower limbs—should be given prompt attention. Ignoring the symptoms can aggravate the condition and lead to additional issues, so contact us for an appointment with Dr. Powers if you or any of your loved ones is experiencing such a problem. Dr. Powers will provide a professional diagnosis and create a treatment plan to resolve it for you. Toe deformities tend to be fairly common in the pediatric population. Generally, these conditions are inherited, with either both or one of the parents exhibiting the same or similar deformity. Many are congenital (present at birth) and progressive (become worse with time). Rarely do children outgrow these particular deformities—unlike foot deformities causing intoeing or out-toeing (which often resolve on their own over time)—although there have been some instances of spontaneous resolution reported. Malformation of toes in infancy and early childhood rarely cause problems at first for foot function. Parental concern at this point is often more cosmetic in nature (“Will my child’s toes always look that way?”). However, as a child matures, a toe deformity can progress from flexible to rigid, and difficulty begins to develop. Left untreated over enough time and conservative treatment tends to be not as effective as it otherwise would. With that being said, it is always worth trying to address a problem without surgical intervention first. Some of the more common toe deformities include overlapping and underlapping toes. Overlapping toes can occur in any of the toes and cause extreme irritation if not corrected. The deformity is characterized by one of the toes lying on top of a neighboring toe. Most often, it is the fifth toe (small toe) that is involved. In cases where central toes are involved, we are more likely to see this happen with the second toe. The reason for this condition is not particularly well-understood. There is a theory that it is related to how the fetus is positioned in the womb during development. Given that this condition is frequently seen in families, there may be a genetic component as well. It is rare for the deformity to correct itself, so treatment is definitely recommended. 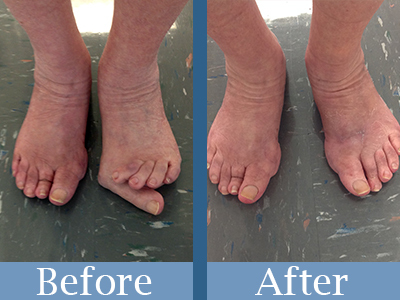 The success of conservative (nonsurgical) treatment for overlapping toes depends on how soon the condition is diagnosed. At early stages, passive stretching is commonly used as part of treatment. Generally, this is performed for about 6 to 12 weeks. Unfortunately, reoccurrence does happen in many cases. Conservative care for overlapping toes in later stages will usually begin by accommodating the disorder. This includes wearing shoes with a high, wide toe box (toe area) and using forefoot supports such as gel toe straighteners, gel toe caps, and toe combs to keep overlapping toes apart. These devices are designed to reduce friction on overlapping toes and relieve discomfort. As the affected individual matures, the deformity typically becomes rigid and fixed. At this time, surgery may be recommended to release a tight tendon or other soft tissue around the joint. If this is the recommended course of action, Dr. Powers will take the time to talk with you first to explain what will be entailed from the procedure and recovery and to answer any questions you may have. Underlapping toes are seen in both pediatric and adult populations. In this case, the most commonly affected toes are the fourth and fifth ones. There is a certain category of underlapping toes known as clinodactyly (congenital curly toes). With clinodactyly, toes three, four, and five on both feet are usually affected. This is fairly common and tends to be seen within families as an inherited condition. As with overlapping toes, the root cause is currently unclear. The condition is generally caused by an imbalance in the small muscles of the foot, but no one is completely sure why the imbalance occurs initially. Underlapping toes are aggravated by subtle abnormalities in how the subtalar joint—the joint where the ankle bone (talus) meets the heel bone (calcaneus)—is oriented. This orientation can result in an abnormal pull on the ligaments in the toes, which then causes them to curl. Over time, the deformity is increased on account of weight-bearing by the foot. Tight-fitting shoes can aggravate the condition, and there is increased likelihood of callousing on an affected toe. Treatment for underlapping toes will depend on the age of the patient, symptoms exhibited, and degree of the deformity. If the condition is caught early and symptoms are minimal, conservative care may be effective. In certain cases, our recommendation will be surgical correction. Dr. Powers may need to release a tendon or perform a procedure that involves other tissue as well. As with any time surgery is recommended, Dr. Powers will help you understand what is going to happen and can answer any questions you may have. 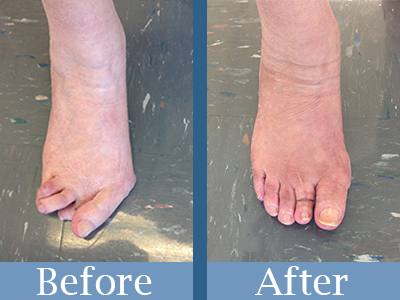 For additional information on overlapping and underlapping toes, or to request an appointment for treatment from Dr. Powers, contact our Bloomington, IN office by calling (812) 333-4422. Our staff will be glad to schedule your appointment and answer any questions you might have, so call us today.